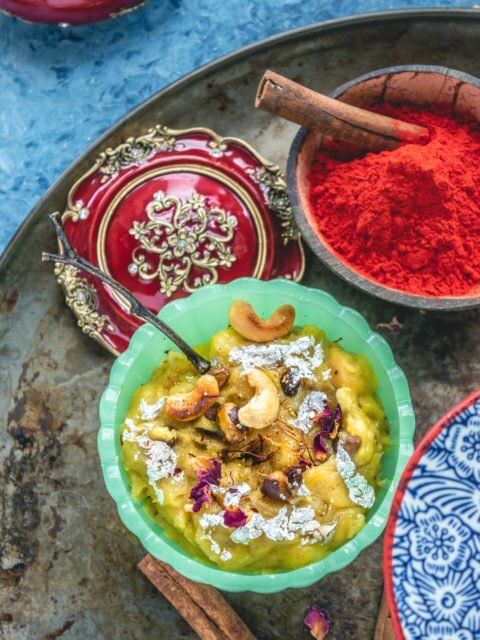 Potato & Sweet Potato Halwa - Holi Special Recipe! 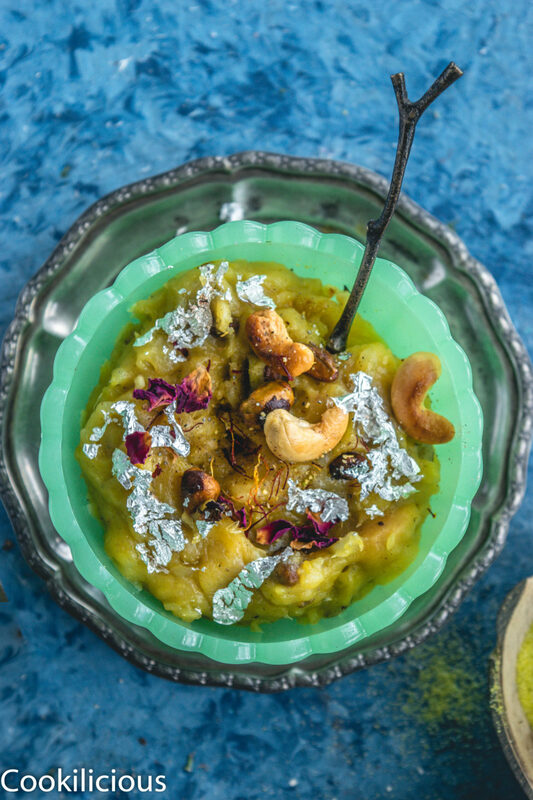 Potato & Sweet Potato Halwa – Holi Special! 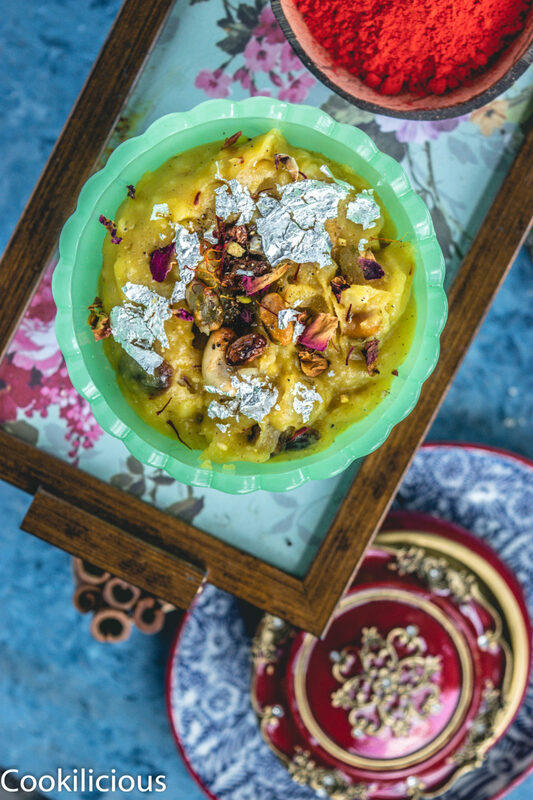 A classic halwa recipe that turns out perfect! 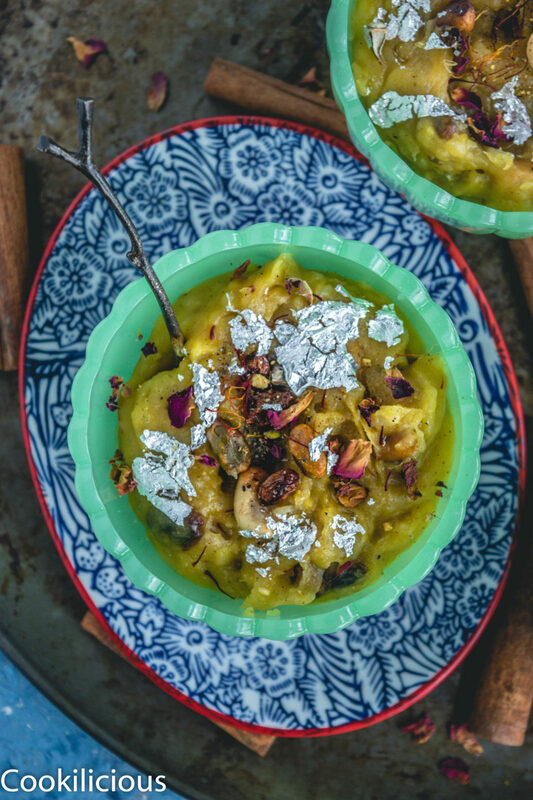 Made with unusual ingredients like potato & sweet potato, this Indian dessert can brighten up any festive day! There are many Indian sweets that have gained cult status over the years. Gulab Jamun, Jalebi, Ladoo, Rasgulla, Kheer and Halwa are just some names that you must have tasted or heard of. 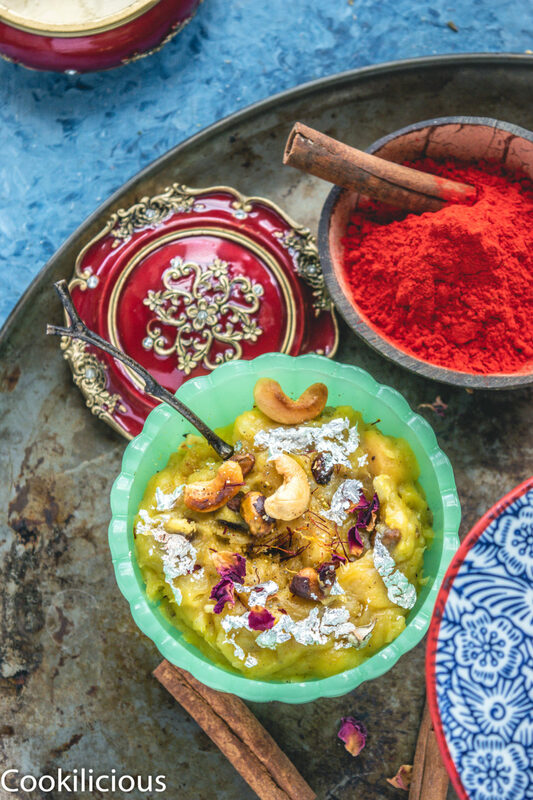 However, Halwa is hands down one of the most popular Indian dessert ever! 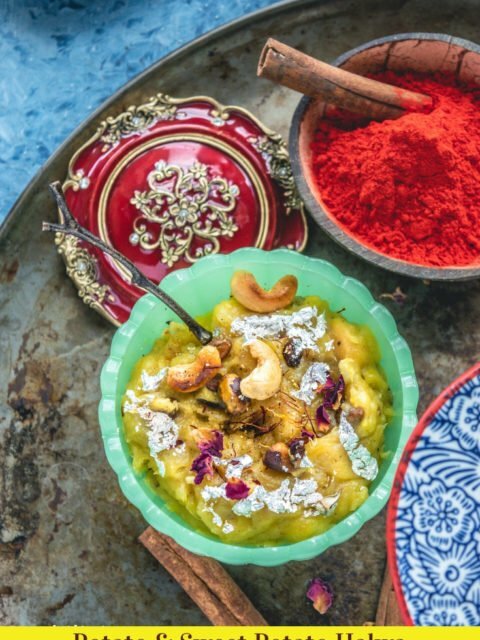 If you watch Bollywood movies, especially those that were made in the 70s,80s and 90s, you will notice that majority of the Hero’s moms would claim that halwa is her son’s favorite and would not need any excuse to make it for him. Today when you look at those movies, it looks so funny and the actors were clearly hamming a lot back then! Nevertheless, halwa always managed to stand out in these scenes. Plus. moms be in Bollywood or in our homes, they all are the same! I remember, every time there came a scene where someone would mention the word ‘Halwa’, I would look at my mom if she was around and ask her to make halwa for me. She would make it for me the next day if not the same day. Now that I think of it, it was really very sweet of her to always indulge me. She being a creative person, would whip up a halwa using whatever she had handy. I am thankful that some of those genes have been passed on to me! But yes, I do have a special bond with Halwa. I never in my wildest dreams would have thought of using potato and sweet potato in a dessert recipe and that too make halwa out of it! It was a South Indian festival called Nombu where we tie a sacred yellow thread around our neck. This festival is mainly for married women. As on this day, the women offer prayers for the longevity and well-being of their husbands. We need to prepare something sweet to offer the goddess as naivedyam. If you are not in a position to cook something sweet, you can even offer fruits. My MIL called to tell me about this festival and then suggested that I prepare some kind of sweet that I can also share with the readers of my blog. Yes, my whole family helps me with my work. She then asked me if I have ever made Potato Halwa. She went on to say that I must prepare this halwa as it has a shock value (no one expects to use a potato in a sweet dish) and is something that tastes great plus its super easy to make. I was lost in thoughts the moment I heard the words – Potato Halwa! I kept thinking what a genius idea this was! Until then I had never heard of this kind of halwa but I definitely wanted to try it out. I asked her for the recipe and then decided to make a small batch as prasad for Nombu that day. I wanted to do a trial batch and see how it tastes before I share it here on the blog. It did turn out great and when I made KR taste it in the evening, he couldn’t believe his ears when I told him that it’s made of potatoes. He asked me if I meant sweet potatoes but I was shaking my head NO with a silly grin plastered on my face. That is when an idea popped up in my mind. I thanked him profusely for this idea while KR looked back at me, clueless. That conversation had conceived this recipe! Right then, right there I decided that I will make it again and this time with sweet potato as well. That I thought would be a great recipe for Holi! What is Holi? It is a festival of colors fondly celebrated all over India. The Color Run you and me participate in today, is pretty much how we celebrate Holi in India. I have always enjoyed this colorful festival since childhood. Ever since I moved to the US, we decided to host a Holi party for our friends here. I am a sucker for making and preserving memories. We celebrate the day will full jing-bang. We play in our backyard and even set up an inflated pool. Kids play in it at first and then its occupied by all the drunk uncle and aunties! There is color, water balloon, water guns and of course lots of food! I have a new menu every year and all our friends look forward to it!
. For those who don’t know, vark is super fine filigree foil sheet of pure metals, typically silver but sometimes gold, used to decorate South Asian sweets and food to make those look more appetizing. The silver and gold are edible, though flavorless. 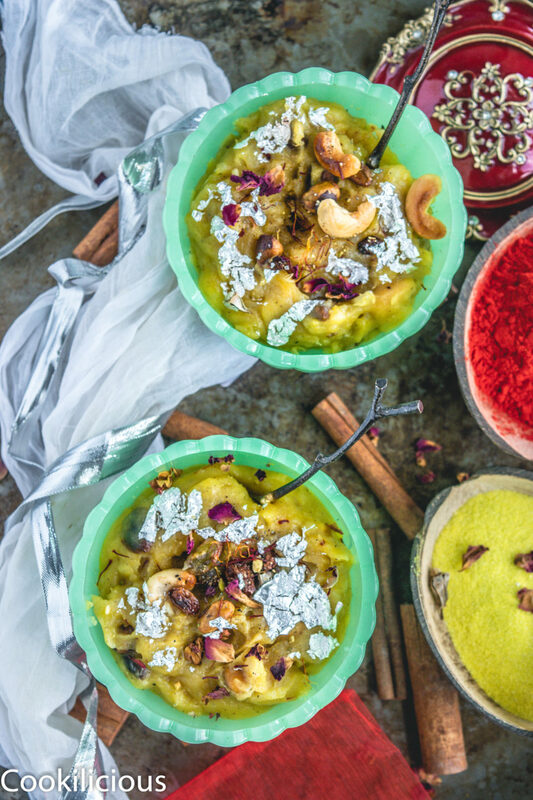 Do try this halwa this Holi and enjoy it the festival! You can prepare this halwa using only potatoes if you don't have sweet potatoes at hand. I have tried both versions and they taste great. The first step is to boil potatoes and sweet potatoes in water. No need to add salt while boiling. Once done, peel and mash them. Meanwhile, fry cashews, raisins and pistachios in ghee. Take it out onto a plate and keep that aside for now. In the same pan, transfer this mashed mixture to a pan with ghee in it. Saute the mixture till it all comes together and forms a creamy smooth texture. The color will also turn golden. Then add milk, sugar and cardamon powder. Mix and cook it ensuring there are no lumps. This could take 5-7 minutes on medium flame. The halwa will not stick to the pan anymore and that is your cue. Lastly add the fried nuts over it, few strands of saffron and serve warm or chilled. I even garnished it with some edible flowers and Vark. You can try using a non-dairy milk for this recipe. Although I have not tried it yet. You can make this only with potatoes. Be liberal with ghee, just for today. Some other holiday dessert recipes that you can try are Gulkand Shrikhand, Instant Coconut Ladoos (No Condensed Milk Required), Apple Khoya Kheer, Rose Sandesh, 2-Ingredient Coconut Macaroons, Vegan No Bake Raspberry Energy Bites, No-Churn Rose Gulkand Ice Cream, Mango Semolina Cupcakes, Eggless Almond Butter Oats Cookies, Jhajhariya/Sweetcorn Pudding, Sweet Potato Nei Paniyaram With Leftover Puran, Granola Oats, Honey &#038; Almonds & Rice Pudding/Kheer, Rabri Ice Cream with Beetroot & Raspberry Sauce, Chocolate Rava Laddu, Cashew & Condensed Milk Biscuits, Hibiscus Strawberry Pastry Puffs and Jam Cigars, Beetroot Halwa, Sweet Potato Puran Poli/Pancakes and Aval Kesari | Beaten Rice Pudding. I am learning something new today! Thanks for the lovely explanation of halwa and the holi festival too, sounds like a super fun event. I didn’t know what Holi festival is until this year, it’s all over Instagram and it looks really fun; wonderful colours and so many smiles! Hoping to get to go to Vernasi next year around this time to be a part of the celebration. This halva sounds and looks really good! This is gorgeous! I’ve never had anything like it – looking forward to trying it. Halwa looks delicious.. Loved the addition of sweet potato to this recipe.